Ellibelle's Corner: Digital Tuesday #7 Tag, you're it! Digital Tuesday #7 Tag, you're it! Hello and happy Tuesday! I hope you are having a wonderful day. And I hope you will get a chance to create something wonderful! Today's card I made for this week's digital tuesday challenge which is to use a tag or tags somewhere on your project. I love the look of tags but always forget about them. I used the gorgeous Emma and the butterfly image from Fred,she said. It was so much fun to color! Fred, she said is also the sponsor of the DTC this week, and this image is one of the 3 things Tracey is giving away to one lucky winner. Click here to see all the other awesome samples by the rest of this super talented design team and to take a look at the two other sets Tracey is giving away. I used copics to color the image. Card stocks used are orchid opulence, chocolate chip, mellow moss and so saffron (all by SU), and white card stock from Georgia Pacific. The designer Paper is from Basic Grey, eva collection. I embellished with prima flowers with rhinestone brads, sizzix leaves, and butterfly with Martha Stewart punch. I also got out my Janome sew mini and did some simple stitching along the edge of the card. Stickles was then applied to the belt on dress, the shoes and the butterflies. The sentiment is from SU's retired set "vases in vogue". I hope you like today's card, and I hope you will get a chance to play in this week's digital tuesday challenge. This is lovely. Love the purple and those flowers are stunning. This is so lovely Ellie! I really like this Emma image, I think she has such a sweet face! 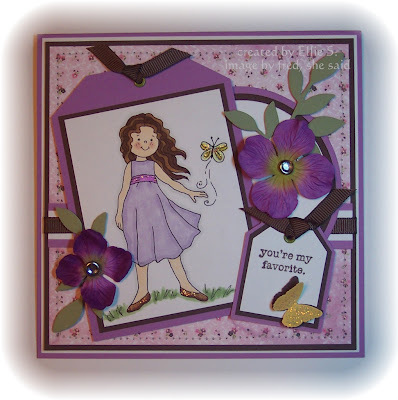 Your purple coloring and flowers are just fabulous! What a sweet little girl this is. You set her off beautifully with your purple card. How sweet - love your colors and coloring! Too cute and love that image! super pretty!!! Love the image on this and your colors!!! lovely coloring! great use of tags everywhere too, thanks for sharing! Beautifully done. Love the colors and the image is also beautiful!